What If I told you that there is a way to make your home look beautiful, impress your friends and improve your health all at the same time? There are a few products that can bring luxury, wellness and aesthetic appeal right into your living space. Whether you want to relax your back, make your workspace more comfortable and relaxing, or you simply want a better sleep, there are few brands that will make your dream a reality. With the technology that modern high-end chairs are incorporating nowadays, you may want to think about skipping a visit or two to a massage therapist. 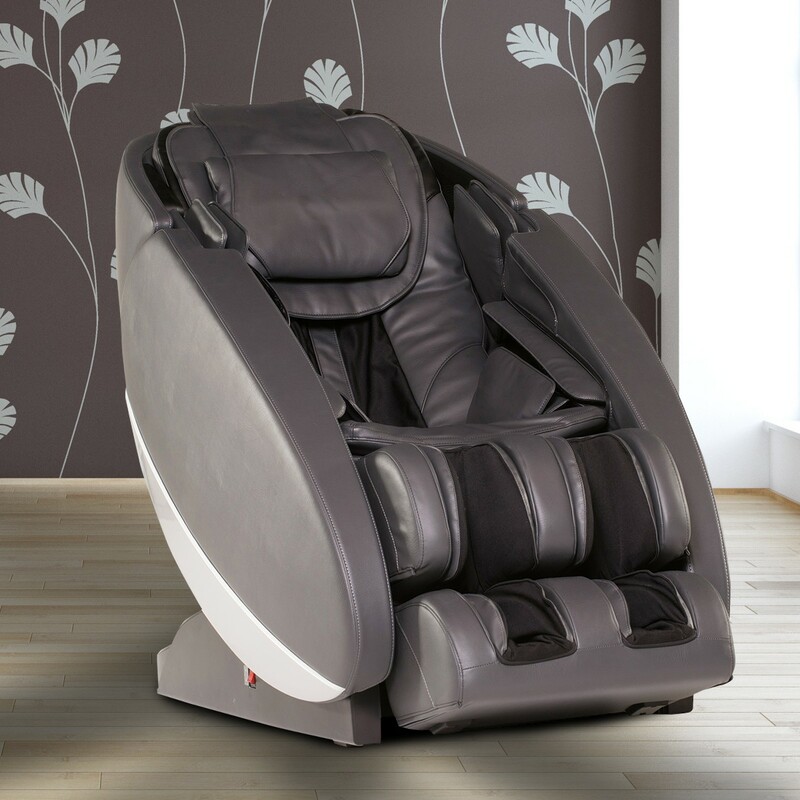 A modern massage chair not only comes with a striking aesthetic appeal but also features a few settings and programs that can deliver a relaxing and therapeutic deep-tissue massage for your back, legs, neck and any other areas you can imagine. It will stretch your sore muscles and help to rejuvenate a fatigued body. A prime example of a luxury chair with up-to-date modern technology as well as modern design is Human Touch® Novo XT. It can provides a soothing massage from head to toe. With 34 auto-wellness programs, the chair offers perfect immersion, effective therapeutic relaxation and complete recovery. Its innovative L-Track Unibody design extends massage coverage from the neck and shoulders all the way down to the glutes. 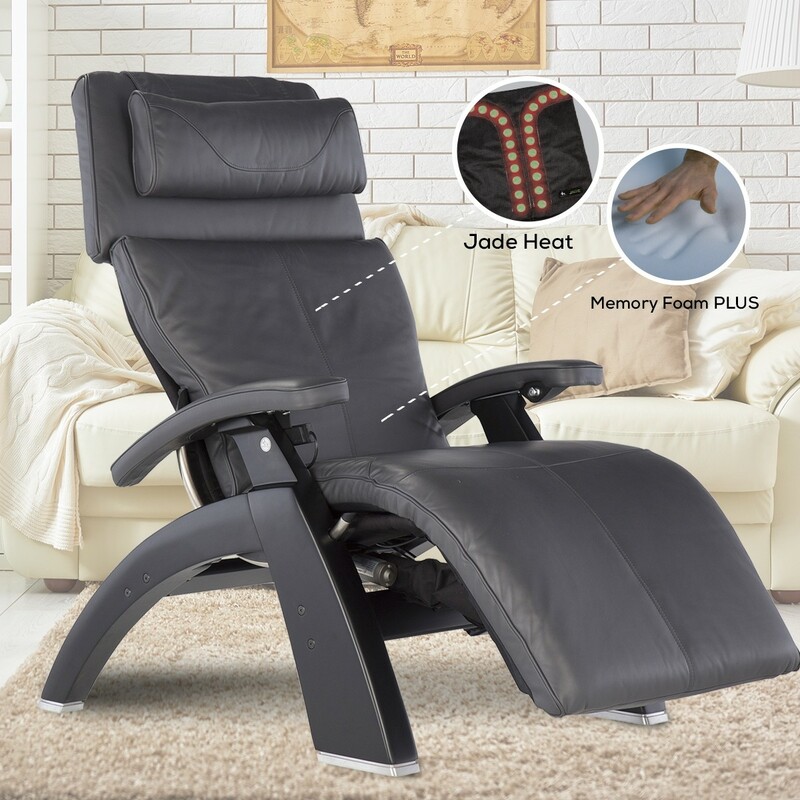 Key features include zero-gravity positioning, full-body stretch, cloud touch acupressure and extendable leg rest that will adjust to your height. It strikes a perfect balance between design and function. A set of well-designed reclining work stations can bring elegance into your working or gaming space, and will no doubt amaze your friends. This new kind of beast now comes with a comfortable chair that provides a perfect leaning position for a superior concentration and productivity boost. That means you can work or game all day without getting tired or compromising your health. Altwork Station has taken the market by storm as one of the most innovative and flexible standing desks for use in the office or at home. 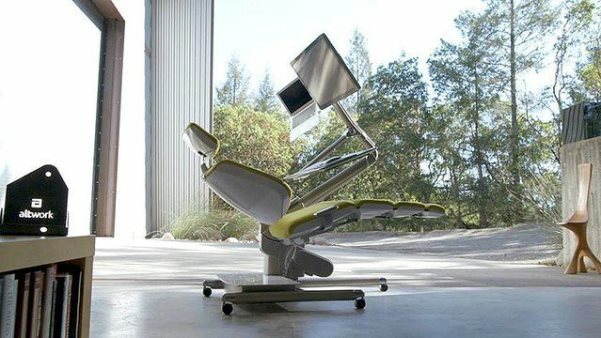 One of the most outstanding features of this workstation is that you are getting the comfort of a luxury chair that can allow you to transition from sitting to standing to a lying position. It also comes with an adjustable metal monitor mount that will allow you to enjoy an optimal viewing experience. Your wireless peripherals can remain intact even as the desk moves, thanks to the magnets that are embedded in the desk as well as within the attached mouse pad. That means you can type, browse and play video games in literally any position your heart desires. Sitting for an extended period of time can not only cause physical stress on the glutes and sciatic nerve but also put pressure on your heart. Relaxing in zero-gravity position allows body weight to be evenly distributed, which eliminates uncomfortable, painful and unhealthy pressure points while ensuring better blood flow. One of the models that can do just that is the Perfect Chair® PC-LiVE™. This stress relieving chair can allow you to sit or lie down in any position without feeling a pinch of discomfort or pain. It is designed with 3D EasePoint Technology™ that uses a fluid-cell cushion to displace pressure while distributing it evenly on the entire seating surface, eliminating harmful pressure points. Another defining feature are the far-infrared Jade Stones that deliver healing warmth up to three inches deep and can help soothe tired and aching muscles. The chair’s premium high-density Memory Foam Plus is highly responsive and can contour the entire body. This feature maximizes comfort and provides the ideal support your body needs. The use of hot air baths as a method of treating and healing ailments has been around for thousands of years. Long before focused light therapy was invented, people created basic saunas by lighting a fire in an enclosed structure. This traditional sauna uses heat to warm air in the surrounding area, which in turn warms your body. On the other hand, infrared sauna uses light to create heat that is capable of penetrating through human tissue. The effect is increased sweating and heart rate, which comes with several anti-aging benefits. There are also a host of other benefits that come with this treatment. 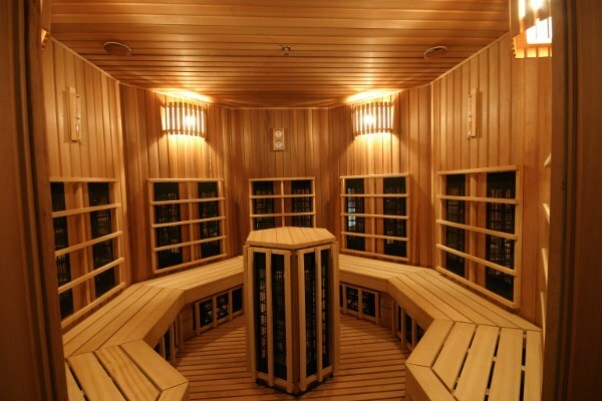 An infrared saunas comes in a small, attractive wooden design that can either be installed inside or outside the house. Installing one near your bathroom or in the garden can not only act as a perfect wellness center, but might also surprise and impress your friends. Apart from anti-aging benefits, infrared saunas come with a number of other great benefits such as detoxification, relaxation, weight loss and pain relief. It can also lower blood pressure, improve circulation, treat congestive heart failure, promote cell health and stimulate faster wound healing. A study conducted in 2010 and published in the Journal of Complementary and Alternative Medicine indicated that people with type II diabetes, who used far-infrared saunas, improved their quality of life compared to diabetic patients who used different lifestyle interventions. People with diabetes are more likely to suffer from depression, chronic fatigue, pain and congestive heart failure. And infrared saunas have proven to provide relief to these ailments too. A memory foam mattress is made of high-density foam that’s soft and energy absorbent. 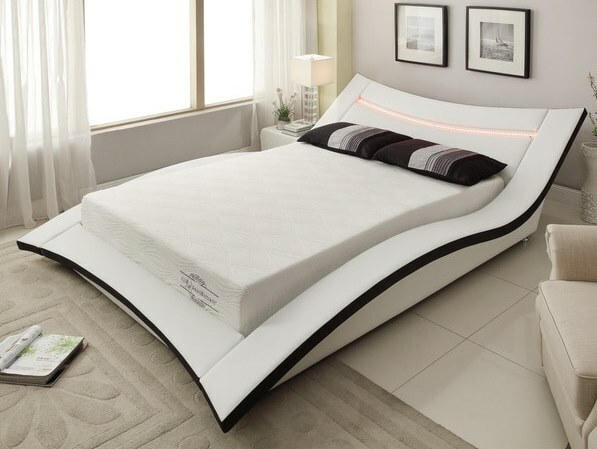 This is one of the distinguishing factors from standard mattresses. The majority of memory foam mattresses are soft, flexible and resilient. Getting one for you or your family can provide you a great comfort, soothing relaxation and ultimately better night’s sleep. All of the above-mentioned products offer viable options for you to enjoy a healthy and productive life from the comfort of your own home. Apart from improving general wellness, these products can go a long way in reinforcing the aesthetic appeal of your living space. Try it and let us know how it improved and enhanced your life.